You may be new to the First Order, but you’re experienced in battle, as an Executioner Trooper in the upcoming Star Wars film! In this fantastic, futuristic Star Wars Episode VIII - The Last Jedi Deluxe Adult Executioner Trooper Costume, you’ll make a powerful entrance to your Halloween bash! 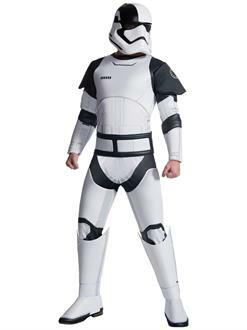 Your look consists of a foam-padded, white jumpsuit with attached shoulder pads to offer your physique the massiveness of an executioner trooper! Also included in this disguise are boot covers, belt and powerful Executioner Trooper two-piece mask! We’re your one-stop shop for all Star Wars costumes for men, women and children!